Happy Spring to one and all! Blossoms of every color adorn the local trees and gardens in our corner of Europe. It’s a good time of year to experience the wonder and variety of nature’s great bounty. 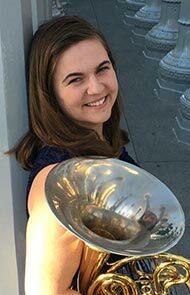 This issue of Horn and More lives up to its name - luminaries from the wide world of brass offer us their insights. We are fortunate to have two interviews this month: Rome-based Mike Applebaum and Chicago’s Jimmy Pankow (yes, THAT Chicago). Mike’s interview is a veritable master class. 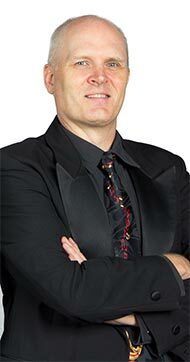 His decades of experience as a classical/jazz/film/commercial trumpeter and pedagogue, most notably as Ennio Morricone’s lead trumpet, have given him a wealth of information and wisdom. 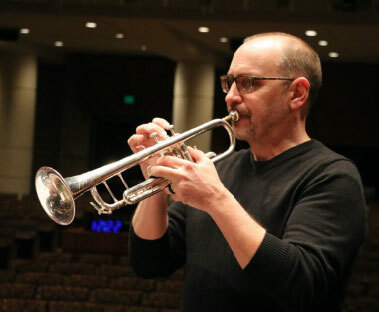 Within the article, he provides a comprehensive introduction to the Pivot System developed by prominent trombonist and teacher, Dr. Donald S. Reinhardt. 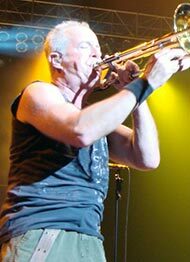 Speaking of trombone players, I was thrilled to have the opportunity to bring to you a bona fide rock star, Jimmy Pankow of the group Chicago. He’ll tell you how he keeps his chops, mind, and energy fresh and at the highest level, 5 shows a week, traveling the world over a career spanning 40+ years. But don’t stop reading there! William Stowman, professor of trumpet at Messiah College in Pennsylvania, shares his Body-Center-Breathe-Flow system; Hirokazu Amakasu gives a short history of the brass band tradition in Japan; we hear about Michael Grose (professor of tuba at the University of Oregon) and his YouTube project interviewing dozens of former students of the great Arnold Jacobs; Sarah Krueger of Indiana University tells us about Brass Gym/Breathing Gym developed by Sam Pilafian and Patrick Sheridan; and last but definitely not least, the horn world’s very own rock star, Dale Clevenger, celebrates the importance of sound quality in our monthly Pedagogy column. I wish you all a beautiful, inspired spring, and of course, happy reading. Kristina Mascher-Turner: Can you tell us a bit about your career path? Where did you study, with whom, and how did you end up in Rome? Mike Applebaum: I started playing in the fourth grade in elementary school, and by the time I was 14 I knew that I wanted to become a musician. The experiences in youth orchestras and various scholastic groups were all very formative and helpful. I was a bit of a classical snob until I was about 15/16, when I heard Blood, Sweat, and Tears’ recording of Spinning Wheel on the radio, and that got me interested in jazz and rock. I studied at the Eastman School of Music (‘73 – ’77), which offers a wonderful opportunity to develop both classical and jazz competencies. My greatest teacher there was my jazz arranging teacher Rayburn Wright. He was just a fabulous musician and instructor! During these years I met Armando Ghitalla during a trip to Boston and managed to have only a 30-minute lesson with him, as he was rushed to get to a rehearsal with the BSO. After Eastman and gigging around in Rochester I moved to Washington, D.C. where I studied with Adel Sanchez (a great teacher and musician) of the National Symphony. I played in the Kennedy Center Opera House Orchestra from ’77 to ’83. This was the most formative time of my early career, in which we performed operas, ballets, and musicals. During that time I was lucky enough to perform with Armando Ghitalla while he was touring with the Boston Opera. This time around I got to know him and asked him for lessons. He was very gracious to spend some time with me. We became friends, remained in contact, and met whenever he came to D.C. He had a powerful influence on me musically although at that time I didn’t fully understand the techniques he was trying to explain to me. He used abstractions and descriptive language that I would come to understand when I subsequently studied with the super scientific and analytical Dr. Donald S. Reinhardt in Philadelphia, just before moving to Italy in 1983. I think what I gained most from Armando was musicality, from observing him always playing with incredible passion and a beautiful singing style. What a musician and generous human being! During a visit to Italy in 1982 I met some musicians in Rome and other cities, and since I didn’t have a full time contract at the Kennedy Center I decided to move to Rome. My life in Italy has been a vast mosaic of the true freelance musician: classical, jazz, salsa, periods of symphony orchestra playing, arranging for studio recordings and concerts, sessions for Italian movie soundtracks, tours with pop singers, television shows, club dates, private teaching, directing youth orchestras, master classes and seminars, part-time conservatory teaching, juries for music competitions, leading my own jazz projects, etc. etc. Only since 2012 have I held posts of regular Conservatory teaching, in Rome and Pescara, where I teach jazz/pop/rock courses. If I had to pick one most important musical experience, it would surely be my three-decades-long working relationship with Ennio Morricone. KMT: Your career has straddled the worlds of classical and jazz/commercial music. What do you have to change in your heart, mind, and chops when you switch from one to the other? Is the transition easy and natural for you? Kristina Mascher-Turner: Jimmy, you have brought pleasure to millions of fans around the globe in more concerts than you can probably count. You’ve shown them that brass instruments can be the heart and soul of a rock band. How would you say this role has evolved over the course of Chicago’s history? Jimmy Pankow: Historically, the role of the brass in Chicago's music was conceived as and continues as a main character in the songs. Essentially, the thrust of my arranging has been to create an alternate melodic voice, almost like another vocal, that weaves around and compliments the lead vocal, while also creating appropriate spots for instrumental step outs. This melodic brass approach has become a trademark signature in our music. KMT: How do you, Lee, and Walt rehearse? Do you still meet for your own sessions together? JP: The section typically rehearses with full band to determine the compatibility of the arrangement. When necessary, we shed the parts in the dressing room to test voicing and accuracy. KMT: How has your approach to the trombone changed since you were younger? JP: With five shows a week, each one being 2 1/2 hours of non-stop blowing (arguably one of the toughest books on the planet), the days off are welcomed! Before each show, to minimize swelling and improve flexibility, I'll do long tones and arpeggios ranging from pedal F up to double high F-preparing the chops for 'combat'! Several years ago, I suffered a split lip. 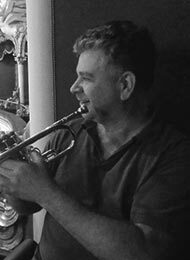 The voicing is typically a trombone lead with the bone 'upstairs' most of the time. Hence the need to keep the lips well-lubricated. After shows, I often apply vitamin E oil and sometimes I apply ice to reduce swelling and heal the sore tissue. KMT: With all the traveling you do, have you got a “survival kit” of items you absolutely must carry with you? 日本の吹奏楽 - The Japanese "SUISOUGAKU"
The most effective pedagogy is simple, repeatable, and effective. Throughout my career, I have always appreciated those perfectly stated phrases shared by teachers in lessons or master classes that seem to immediately make sense and have a lasting impact. It seems that great pedagogues have handfuls of these phrases at their disposal to wield at any given time and usually at the perfect moment. I have worked diligently to build such a vocabulary and work each day to add to my collection. To that end, Body-Center-Breathe-and Flow was born of the need to create a simple, effective catchphrase that could serve as both an outline for instruction, as well as a powerful mantra heard by the player in the moments before sound is generated. In fact, the phrase itself fits beautifully into a four-beat preparatory pattern (1-and, 2-and, 3-and, 4) that reminds the player of the most vital aspects of making a great sound as they stand, or sit, to deliver. Much work has been done to categorize the most important elements of efficient playing. The phrase Body-Center-Breathe-and Flow is a distillation of four common issues: Posture, Ergonomics, Breathing, and the Airstream itself. Couched in the idea of the Spiral Curriculum, these issues are introduced to beginners, then refined and repeatedly addressed with performers throughout their career. While the basic pillars remain a constant, the amount of detail associated with each one increases exponentially as players develop physically, gather more information, and gain experience. As a result, the system has been effective with students from the elementary level through the adult level. If you’re anything like me, you believe that efficiency is the name of the game. We all want to achieve effortless and efficient ways of playing our instrument, yet sometimes it seems more like a concept instead of something that can be applied in a practical manner. So how can we practice using our air and lips efficiently while maintaining “necessary” tension to create beautiful sounds? For me, the answers are in The Breathing Gym and The Brass Gym. Ever been teaching in a classroom full of students who just got back from lunch, hyper as can be? What about those times when you have no idea where to start practicing because you feel the need to practice EVERYTHING? Or how about playing the big solo in Tchaikovsky’s 5th Symphony where all you can think about is how loud your racing heart beat sounds? Sounds crazy, but I’ve been in each of these situations and can tell you that I have used principles and concepts from both The Breathing Gym and The Brass Gym to help me out. So what is the Breathing Gym and Brass Gym? The Breathing Gym is a book and supplemental DVD created by Tubists Patrick Sheridan and Sam Pilafian intended to assist Band, Chorus, and Orchestral Wind musicians with, “tone, stamina, and all-around performance” through exercises that, “can be used as part of a warm-up routine, as a mid-rehearsal change of pace, or to address specific issues such as dynamics, articulation and phrasing”. The Brass Gym is a comprehensive book of exercises, routines, and workouts designed as an expansion of the principles addressed in The Breathing Gym. Why did you choose to play the horn? I ask every new student this question. Invariably, the answer is ALWAYS the same…because they like the sound. It’s the reason that I play the horn. The tone quality of our instrument is without a doubt Unique, Special, Wondrous, and “Golden”. Therefore the initial emphasis in my thinking, teaching, and playing is always about a Beautiful, Lovely, Refined, Diverse, Magical, Adjustable, Convincing, Compelling SOUND QUALITY! Our tone should attract and hold the attention of the listener. The horn player’s ability to accomplish this is dependent on two very important and obvious concepts in musical performance, expressed in the following terms for clarity in understanding my pedagogy. We must consider also a player’s personality, schooling, goals, habits, abilities, skills, gifts, motivation, and traditions. 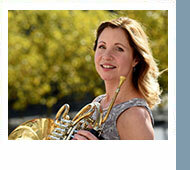 Therefore there is an incredibly multifaceted variety of musicians who play the horn. Our “HORN WORLD” is so amazing, interesting, fascinating and diverse! With this background of the broad concepts listed above, I will be more specific and list many (but surely not all) of the items which we must practice, study, and work on daily to try to arrive at the highest artistic level possible and necessary to be able to perform professionally. 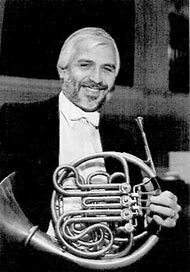 We've created a new section of the IHS Forum specifically for feedback and discussion of the topics and ideas presented in Horn and More. All subscribers are welcome to log in to their user accounts and contribute to the discussion! For sale only by pre-order. This is not the event t-shirt that you will receive as part of your registration for the IHS Symposium in Muncie. 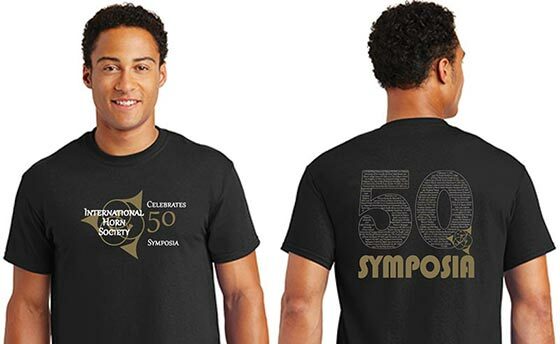 This t-shirt commemorates 50 years of IHS Symposia! It is a high quality black t-shirt, with Gold Foil on both the front and back, as well as gold metallic and white ink. The back of the t-shirt lists the years and locations of all 50 Symposia. You'll have a great time, locating all that you've attended, plus noting the ones you missed. We're hoping to have some photo ops in Muncie with everyone wearing these commemorative shirts. You MUST pre-order this shirt. We are placing the printing order for the shirts based on pre-orders, so we will not have many (or any) for sale at the Muncie Symposium, but you will see all your friends wearing one. So purchase one NOW and don't miss out. Deadline for ordering: June 25, 2018. If you simply cannot attend the Muncie Symposium (so sad), you can anxiously wait by your mailbox for your shirt delivery by USPS Priority Mail, as soon as the Symposium ends. You can still enjoy wearing your shirt at any horn related event and at future Symposia, or even just while practicing.